As family physicians we're always encouraging patients to take ownership and control over the disease by making sure that they know what is essential for asthma management. We know that patients need to understand when their asthma's out of control. 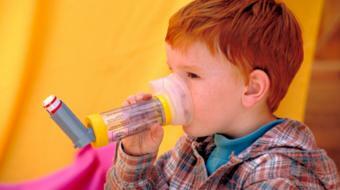 The things they can do to pick up on asthma that is out of control is understand their symptoms typically over a week. If patients are having nighttime symptoms, if patients are feeling short of breath during the day, if they're exercising feeling short of breath, if they have to miss school or if they have to miss work, we know that their asthma is out of control. Very importantly, if patients are using their rescue inhalers, often a blue device, more than four times a week, it's a sign that their asthma is out of control. As a patient it's important to remember each and every time you see your family physician, your healthcare provider or pharmacist, it's an opportunity to review what is ideal inhaler device technique. We know that patients who don't use their devices properly end up having more side effects, poor asthma control, more complications, more hospitalizations, and in fact, could increase their risk of death. So, speaking to your healthcare provider and family doctor is very important. When speaking to your healthcare provider about inhaler device technique there's several things that they can do. They can watch you use your technique properly and give you feedback and tips or perhaps every time you pick up your medications from your pharmacist, you can ask your pharmacist to review and provide some feedback on ideal inhaler device technique. Perhaps your healthcare provider or family doctor can give you a handout on what are the key steps to using your inhaler properly or suggest an on-line website with the ideal inhaler technique that you can review at home. The information that was provided was for informational purposes only and I want to encourage you as a patient that if at any time you feel your asthma is out of control or you have a question, go seek help from your family doctor or healthcare provider. Getting your asthma device technique assessed regularly can help improve your asthma control and quality of life. If a patient is using more than 4 puffs of ventolin per week, it is a sign that their asthma is not well controlled. When first tested up to 80% of patients with uncontrolled asthma failed to use their asthma MDI device properly. When patients don't use their asthma device correctly, less medication is delivered to the lungs which can contribute to worsening symptoms. It is normal for asthma patients to wake up at night with symptoms. Compliance with asthma medications and proper device technique can allow patients to live a symptom free life.